Any one share some suggestions about how to Write Well-Structured and a Perfect Robots? Kapow software is the self­service automation andintegration company. Kapow Katalyst is a product of kapow software. Kapow Design Studio is the Kapow Katalyst application for writing and debugging robots. Kapow Software delivers data integration platform for managing critical data from various sources. web browser. Robots can automate any set of mouse and keyboard instructions that you would otherwise have to perform manually. debugging capabilities, an overview of the program state, and easy access to context­ sensitive online help. Design Studio is the application for creating robots and types. In Design Studio, you can also debug your robots and create database tables for types that need to be stored in databases. Design Studio also lets you create the types that are used by robot variables for data extraction and input. With Design Studio's Type Editor, you are able to design types that are modeled after real­world data. In the most common case, a type is designed to hold the data that a robot extracts from a data source. Design Studio is a programming environment for creating robots and designing types. Robots are created using a special­purpose programming language with its own syntax and semantics. Like other programming environments, Design Studio uses several concepts that you, as a robot designer, must understand in order to fully comprehend the workings of Design Studio. The purpose of this section to introduce the most important concepts and it is recommended that you refer back to this section whenever you encounter a concept you do not understand. The most important concept in Design Studio is a robot. A robot is a program designed to accomplish some task involving a data source, usually a web site, but it could also be an Excel document or a database. Typically, one robot is written per task per data source. Basically, a robot can be programmed to do automatically everything you can do in a browser, as well as extract data from a database or an Excel document and combine this with storing data in a database, file, etc. A side­effect of writing well­structured robots is that it often also makes robots load faster in Design Studio and generally be more responsive when edited. The two main tools that you have at your disposal to write well­structured robots are Snippet steps and Group steps. Both these two types of steps are used as a way to take a part of a robot, give it a descriptive name and let you pack it up in a single step. In this way you can forget what the part of the robot does in detail and concentrate on other issues of you robot. This is very similar to other concepts found in other programming languages, e.g. methods, function, procedures, etc. It is important that you can give a relatively short descriptive name to the group step that describes what the steps inside the group does. If you can't then it is probably because they do not perform a well­defined task. Introducing a group step you help document your robot, because the name describes what that part of the robot does. Although snippet is mainly introduced to share functionality between robots they can also be used inside a single robot to help structure this. If you have a collection of steps in robot that is used in several branches. A snippet is a group of steps that can be reused in several robots.A snippet is maintained in a file separate from the robot. Whenever the contents of a snippet is changed in one robot, it is automatically updated in other robots that uses the same snippet. A snippet is inserted into a robot using the Snippet step, and edited in­line. Snippets contents cannot be edited without being inserted into a robot. 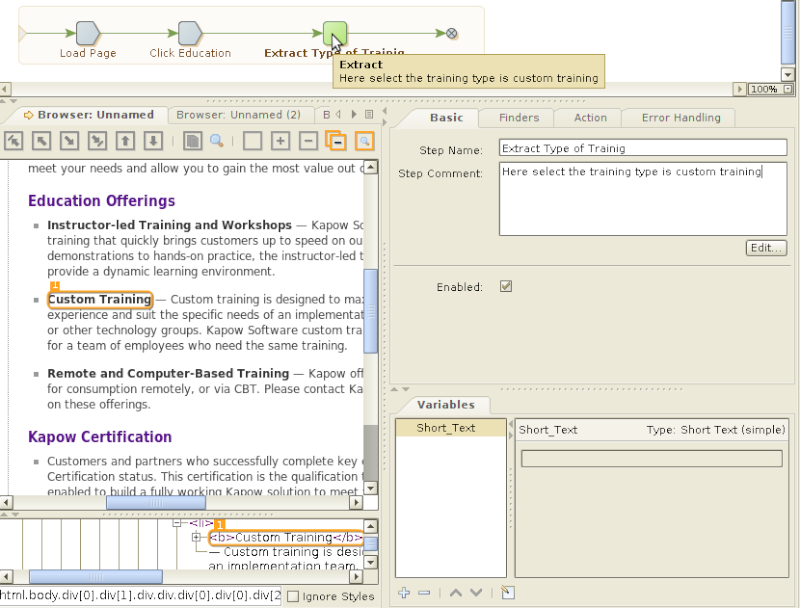 Common steps used for various robots are created as a snippet. Giving proper comments and nameing are the importent for develop a well structured robots. In a step configuration we can edit the step name and comments. 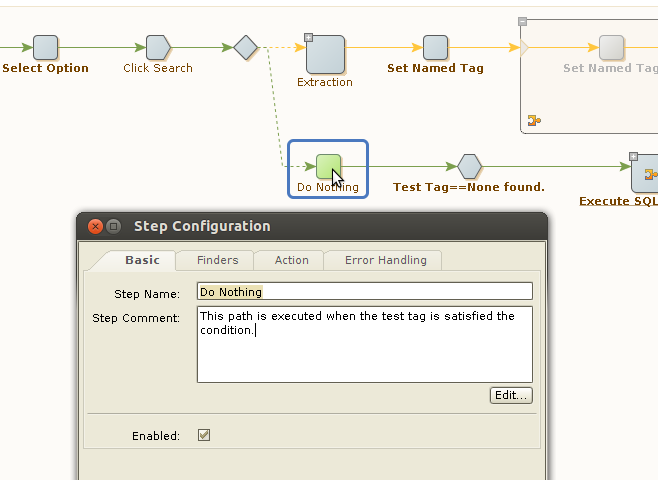 Using Do Nothing action step we can give comments to the path. An every step we can give comments, but there is no option for giving comments for path, here we can use Do Nothing Action step.